I’ve been running the Serfas Thunderbolt headlight and taillight for about 6 months now, and have used them on a variety of bikes and for a variety of applications. 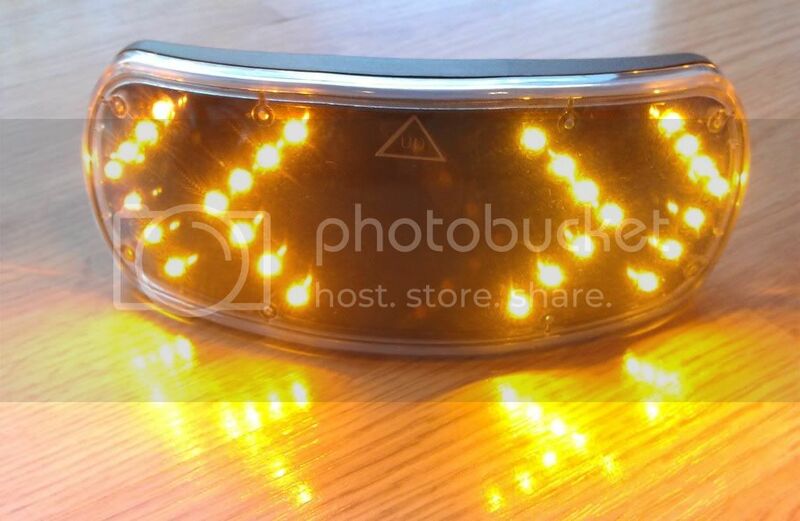 These lights are USB-powered and use micro-LED strips rather than bulbs. Let me tell you – the LED strips are BRIGHT!! It hurts to look at them even obliquely. This is both a positive and a negative. It’s a positive because you get around 180 degrees of visibility from each light – way more than you typically get from either headlights or taillights, and it gives a degree of confidence that you can be seen from the side nearly as well as from the front or rear. The negative? Well, you can’t mount them quite everywhere you might want to without getting blinded! Despite the brightness, these are definitely more in the “be seen” than “see” category of lights – they don’t light up enough road/trail to function in that fashion, but that’s OK since it’s not what they were designed for. I liked using them in tandem with a brighter headlight, and mounting the Thunderbolt to my fork. However, I couldn’t do this with every bike, since on some of my bikes the structure of the fork meant that a decent bit of the light actually went back up into my eyes! Not really a fault of the light – but a note for those who might be thinking of using a light in that fashion! The lights are encased in a silicone rubber body with straps that allow quick attachment and detachment to/from just about any part of your bike. I initially thought they might not last very long, but so far the only thing that’s happened is that the (white) models I received are no longer white, and the little flap that covers the USB charge port is a little loose (not a big deal, since that bit sits pretty tightly against the bike frame/handlebar/etc). The flexibility of being able to put a light pretty much wherever I want is AWESOME. I don’t know why more light manufacturers don’t use this method. I’ve attached the lights to bars, forks, seat stays, racks, and a trailer. No problems with them staying anywhere! Once attached they stay put. According to Serfas, “burn” time is “1.75 hours (high beam); 7 hours (low beam); 3 hours (high blink); 9.5 hours (low blink).” My experience would indicate that these numbers are a little on the high side, but I can’t say for sure as I often wasn’t running them totally in a single mode for a single use (I definitely never used them on low blink for 9.5 hours). I DO know that the front has run out in under 1.5 hours of total use (two 45-minute trips in the dark, separated by about 2 hours). Similarly, I think the other modes run out in a bit less time than advertised. The only one where I’d say this is a true negative is with the high beam for the front. Most of the time, that’s the mode I want it in – and since I do ride for longer periods at night, it’s possible for my ride to last longer than the battery. I’d also say that for anyone who is not commuting to a destination where a friendly USB charger awaits, this might be a little short for longer there-and-back-in-the-dark commuting. However, it probably will cover 90% of potential users just fine. 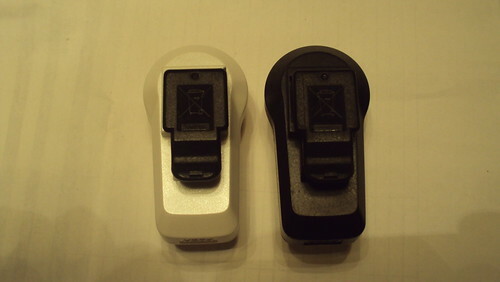 The on/off button also functions as a mode switch (short hold to switch modes, long hold to turn off). Pretty standard commuter light function, and I never had any issues. The only (slight) beef I had with the switch is that it’s a little tough to manage in winter gloves – on multiple occasions I had to remove a glove to turn a light on. Those of you in warmer climes (or who are only fair-weather riders) won’t be bothered by this. TL;DR summary: the Serfas Thunderbolt lights are a solid set of be-seen lights that offer unparalleled side visibility and impressive brightness for their size. Run times may be on the shorter end, but the attach-anywhere flexibility brings the Thunderbolt solidly into the “good buy” category. 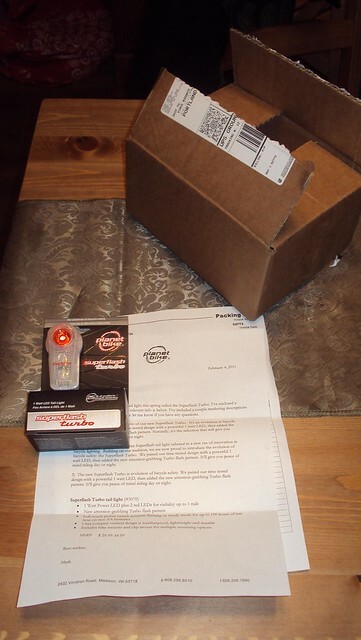 A while back, ElectroStar sent us their Wireless Signal Pod Turn Signal for review. ElectroStar is an LED company by background – their parent company, Buztronics, manufactures LEDs for a very wide variety of uses (RL, you should get some scooter lights!) – so we were happy to test out the Signal Pod. 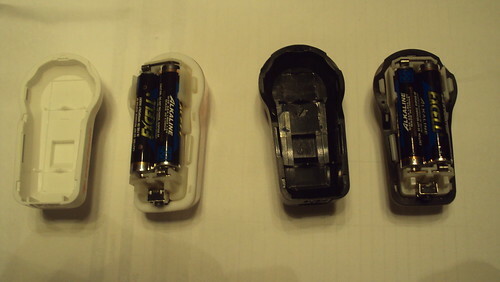 The Signal Pod retails for $49.95, a price ElectroStar justifies given its wireless capability (a wired version sells for $10 less), and comes with the Pod unit, a control unit, a seatpost-mount bracket, and pre-installed batteries. With the controls, you can signal a right turn, left turn, or turn your “hazard” lights on by having everything blink (though I’m not sure I want people to start thinking of me as a hazard as I go down the road!). Out of the box, things looked good – the LEDs were very bright, and the wireless signal works from well over the required distance (I tested it at up to 30 feet). It mounted to my bike fairly easily as well, and the signal buttons were pretty intuitive. I also liked that the turn signal was sequential – each chevron lights up in sequence, making it very clear which direction you’re turning! Unfortunately, that was where the good things ended (had I known this, I would have taken more pictures earlier on… sorry folks!). One of the advertised features is that the Pod beeps when the turn signal is on. While some sort of noise is definitely a good feature since you can’t see it, the beep is incredibly annoying. It’s not bad if you’re taking a turn on the go, but sitting at a traffic light for a couple minutes is somewhat brutal. The noise wasn’t the worst part though – the worst part was that it only has a seatpost mount, and when I got on my bike the backs of my legs hit the pod! I’d like to say it’s because I’m just so muscular, but I’d be lying… I’m sure it works for some bikes, but it didn’t work for my commuter… and I’d never thought it was an unusual design. Determined to get this thing through a more extended test, I jury-rigged a setup (using an old piece of PVC and an extra stem I had laying around) to attach the mount to the back of my Burley trailer. I had trouble getting the signal mount off my handlebars though, and ended having to cut one of the bolts off. Before I could get a replacement bolt in, my kids (ages 9 months and 3) bumped into the signal pod (still mounted on the back of the trailer) a couple times and broke that bracket. SO… that was the end of the test for me – and somewhat of a deal-breaker, since if my 3-year-old can break something by walking by it, I know it’s not going to stand the test of staying on the trailer for a long time. 1. Different brackets. Almost everything else I buy to put on my bike (lights, fenders, computer, etc) comes with multiple mounting options or at least a flexible fit system – I think this should too. I’d especially like to see a rack-mount option – most commuters use rear racks, and what’s on the rack often blocks the view of a seatpost. 2. Durable construction. I won’t say I never break stuff… but I don’t usually break stuff unless it’s on my mountain bike and I crash. 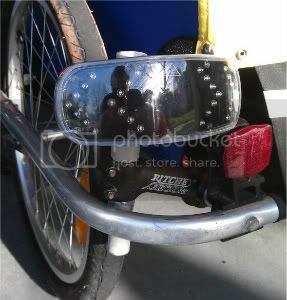 These lights are meant for commuting – they should be able to take a hit from another bike in a bike rack, for example. Currently, the brackets just aren’t durable enough. 3. Incorporate some bar-end signals for forward and side visibility. When sitting at a stop sign, I still had to use hand signals, since those coming from other directions couldn’t see the light. 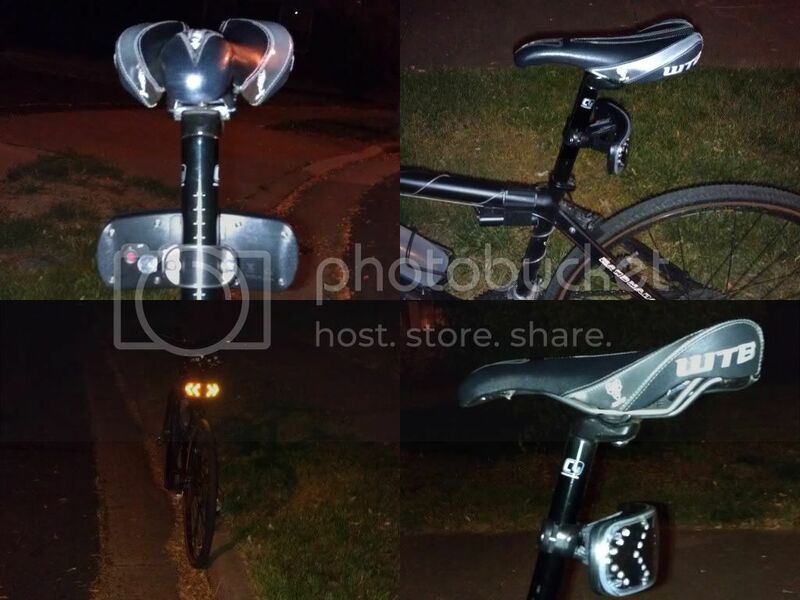 I’d be excited to buy something with that capability – and ElectroStar already makes bar end lights. 4. Change the beeping noise! Yes, it’s a minor complaint, but I was frankly relieved when I didn’t have to listen to it anymore. 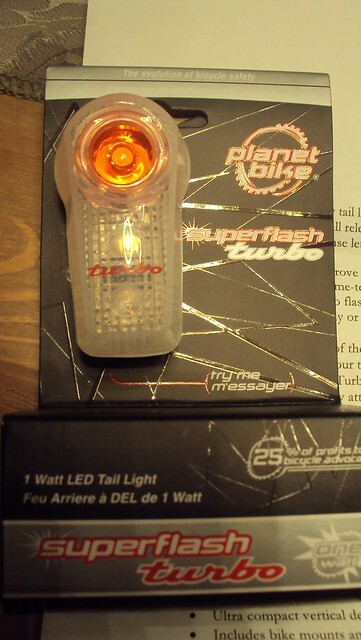 Product Review/Sneak Peek: Planet Bike Super Flash….TURBO! I arrived home from work the other day to find a small brown box addressed to ‘lil ol’ me! Oh! What could it ever be!?!? Mark from Planet Bike sent out a new product to try out that will be released this Spring! Introducing the NEW 2011 SuperFlash TURBO! 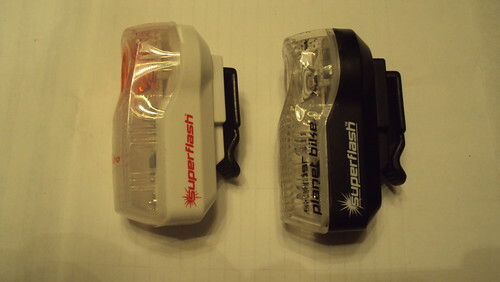 In 2006, our introduction of the Superflash tail light ushered in a new era of innovation in bicycle lighting. Building on our tradition, we are now proud to introduce the evolution of bicycle safety: the Superflash Turbo. We paired our time-tested design with a powerful 1 watt LED, then added the new attention-grabbing Turbo flash pattern. It’ll give you peace of mind riding day or night. Since I had just ridden home from work, my first chance to test this light out would be on my next trip to and from work. I am excited to say I was one of the most visible people out on the wet streets of Portlandia! Many more miles of commuting ahead of me… I’ll give you an update at a later date…gotta ride!